First time expecting moms always ask about books. Bookstores have entire sections devoted to pregnancy and parenting. With so many choices out there, which books are helpful to have on hand for your library? Here are a handful of books that I highly recommend. On the pregnancy side of things, there are two books that I suggest having close by. The classic What to Expect When You’re Expecting by Heidi Murkoff and Sharon Mazel is a staple resource to have on your nightstand. For over 25 years, moms have turned to this book for guidance. It is sort of an encyclopedia specific to pregnancy. This book covers preconception, conception and pregnancy. With chapters dedicated to each month of pregnancy, the book can give you insight throughout your journey. A more laid back and fun read for your collection is the Girlfriend’s Guide to Pregnancy by Vicki Iovine. This book reads like a conversation you’d have over lunch with your girlfriends. It tells you those things that What to Expect doesn’t really cover. Like cautioning against wearing spandex from head to toe during the third trimester. For new moms, i recommend three books and a video. What to Expect the First Year by Arlene Eisenberg, Heidi E Murkoff and Sandee E Hathaway BSN. This book is play by play guide to raising a newborn. It covers with chapters dedicated to each month of development. There are also chapters on other related topics like fatherhood, postpartum care and adoption. Another must have book is Healthy Sleep Habits Happy Child by Marc Weissbluth MD. Recommended by Bobby’s peditriacian, this book is a must have. It details the importance of sleep for newborns and young children. It then gives step by step instructions for helping your child to get that sleep. Chapters are dedicated to different stages. It also has an entire section on different sleep problems and solutions. 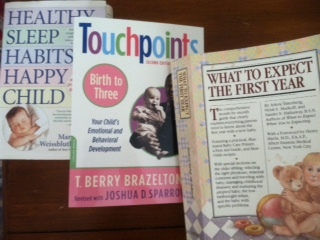 The last book I recommend is Touchpoints – Birth to Three by T. Berry Brazelton MD. The other books I’ve recommended cover more the physical development of raising a child, whereas this one deals with behavioral and emotional development. Overall Dr. Brazelton in this book has a way of explaining what kids are going through in a very understandable and compassionate manner. Chapters detail different ages and stages. Other chapters address specific concerns that arise along the way. For example, there are sections about fears and potty training. Personally, I’ll be turning to this often as Bobby will be venturing into the world of potty training soon. The last resource I recommend borrowing or purchasing is the Happiest Baby on the Block by Dr. Harvy Karp. In this video, Dr. Karp shows parents how to soothe an upset baby. It works! What is your go to parenting guide? Feel free to weigh in below. This entry was posted in Uncategorized on February 26, 2012 by Modern Mama.